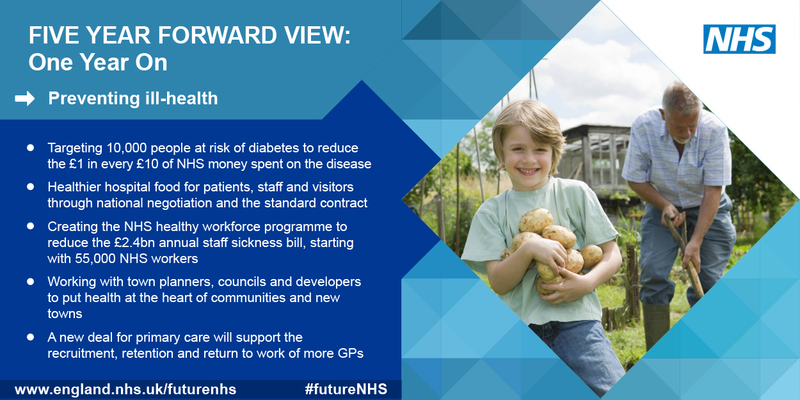 This week marks the first anniversary of the NHS Five Year Forward View. Prevention is one of the three central themes in the Forward View and today, Kevin Fenton of Public Health England, has set out the progress to date and the next steps in supporting people to lead healthier lives. Read Kevin’s blog on the PHE website. We will be publishing further blogs on the other themes, new models of care and efficiency, over the next two days. Progress on delivery of the Five Year Forward View will feature as part of NHS England’s Annual General Meeting on Wednesday and you’ll be able to watch live streams of anniversary events on the NHS England website. You can join in the conversation on Twitter at #FutureNHS all week.